The show floor. I looooove the light curtains! I was out "partying hard" last night (actuality: attending a local artist's open house with a friend then going out for a late beer and good conversation with the same friend), so I didn't get this put together, and then Squarespace had a login glitch today that delayed me again. Oh well, it just means y'all will have pretty quilt pictures to look at this weekend instead of today, right? In other news, we had super yummy homemade pizza for dinner tonight followed by a goofy family dance party which totally made my day. THEN, when I finally went for my evening run about 8:45, I ran the WHOLE THING. I've been running for a couple months now, and usually do about 2.5 miles 5-6 times per week (and sometimes sub in a 4 mile route), but today was the first time I didn't take any walking breaks. YAY! 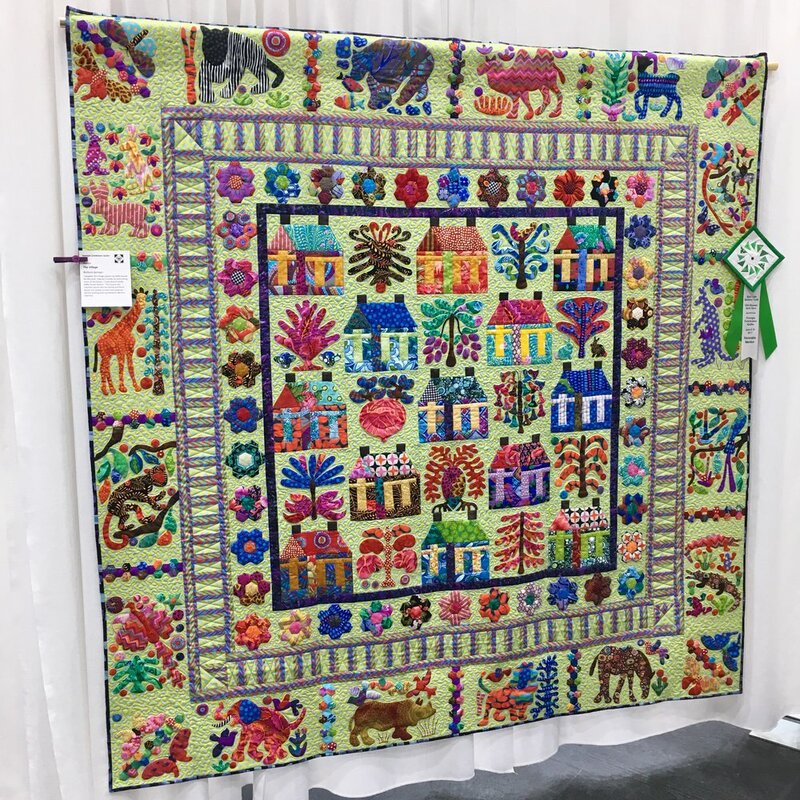 "East Cobb Quilters’ Guild was formed in 1982 by a group of thirty quilters in Marietta, Georgia whose vision was to promote and perpetuate the art of quilting. Since that time, the Guild has grown to nearly 300 members, fostered the development of many nationally- and internationally-known quilt artists and businesses, produced the state’s largest judged and juried quilt show, Georgia Celebrates Quilts®, and enriched the lives of the thousands of quilters who have enjoyed the inspiration, knowledge and friendship that Guild membership provides. From the start, the Guild has relied on the volunteer time of dedicated members. Many important tasks are needed to keep things running smoothly – membership records, newsletters, programs and speakers, and more. Leading the way have been our Presidents. We would not be who we are today without their dedication, vision, and hard work." Now, the eye candy! And, because this is my blog after all, y'all are stuck looking at my quilts first. ;-) The quilt on the left is "Georgia" which I made for Quilts for Cure as part of the E Pluribus Unum Project. The quilt on the right is Murmuration 2.0, one of my Modern Impressionist Quilts. Both quilts are my original designs. As I mentioned, this was my first show, and it was a wonderful experience! I'm thankful for both the encouragement and the suggestions I received as part of the process! Next, a tiny, tiny sample of the show. There were something like 350 quilts hanging. It was amazing, and I won't pretend to be able to capture it for you, so here's just a few of the many beauties. And, of course, I have to highlight a few quilts by my friends. "Bonkers" by Lynn Rinehart. This whole cloth quilt is all thread painting. I'm kind of bonkers for it! "String Spider Web" by Jen Greer. Y'all, the quilting in those green borders is particularly amazing. "Snow Day" by Andi Settlemoir Barney. In addition to doing the amazing quilting, Andi also dyed the fabric! "Hogwarts Required Reading" by Pam Cobb. I'm a bit of a Potterhead, and this is just too much fun. I can't even handle it. My friends are so amazing! 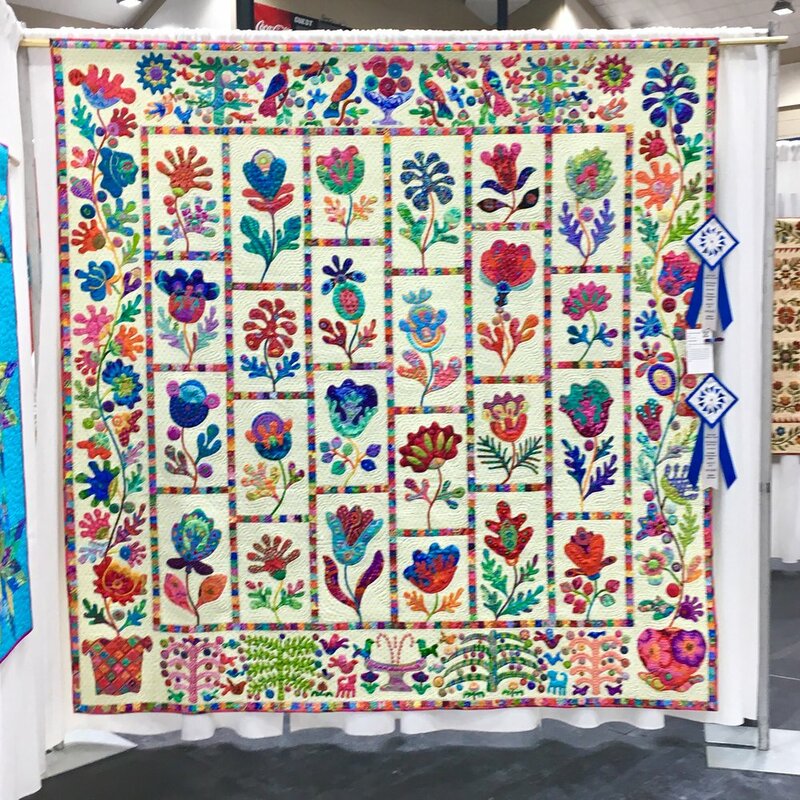 Lynn, Andi, and everyone else who worked so hard to make Georgia Celebrates Quilts 2017 happen-- thank you!! It was an honor to be part of the show!! Well, the Saturday Newsletter will be out in just a few hours, bringing you quilty inspiration in time for your morning coffee. If you haven't already, take a minute to sign up! You can find me daily on Instagram as well @stringandstory. My feed is pretty quilt focused, but don't miss out on my Instagram Stories where I love to share all sorts of behind the scenes goofiness. With me, Hubster, 1 and 2 year old boys, and three cats in this house, there's all kinds of shenanigans around here! I'll be back on Monday for the #MachineQuiltingBlogHop, and until then, happy sewing and Happy Father's Day!